Use Coupon Code 13THDAY to receive 30% off any of the color Soft Flex Trios. Add Show Your Colors or Jewelry for the New Romantic to your shopping cart and receive 25% off the listed price! There is no coupon necessary, only $14.96 per book! 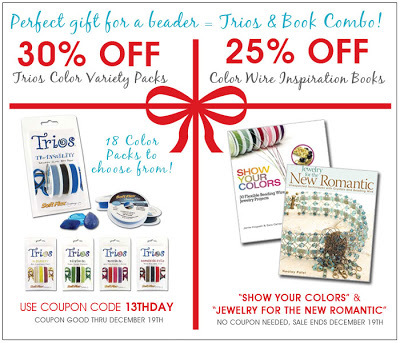 If you buy both a Trio and a book together, your bottom line price is only $26.83. Both offers are good through December 19th.